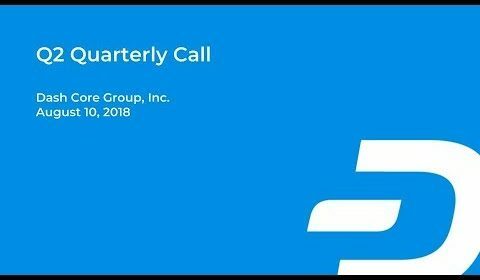 Below are my key takeaways from the Dash Core Group Q2 2018 conference call. The call in its entirety is available above. The highlight of the call was the unveiling of a draft version of the Dash roadmap. This will be updated and finalized over the next 90 days after an assessment by Carroll, but the draft remains fairly reliable. Next iteration is 12.4, considered “pre-Evolution,” which is slated for release at the end of Q3 or beginning of Q4, and will contain DIPs 2, 3, and 4, introducing deterministic masternode lists, various PrivateSend improvements, and automatic InstantSend locking without extra fees for simple transactions. Version 13.0, considered the Evolution launch, is scheduled for late Q4, and will include blockchain users, DAP architecture, and DAPI (first ever DAPI thanks to the masternode network), as well as the initial release of the DashPay mobile wallet (the most long-promised and visible aspect of Evolution). Finally, 13.1 (contract versioning, contract data triggers, merchant features for DashPay and more) is set for the first half of 2019. Dash is committed to removing the need to run a full node for full functionality, (the opposite of the Bitcoin approach). Carroll has significantly assisted in professionalizing the development process, and with his hiring Core has rounded out its management team, which was a significant obstacle last year. Now the Core team should be able to run efficiently. With regulatory issues on the constant forefront of cryptocurrency, concerns have abounded about a regulatory crackdown, especially with fears of the US Securities and Exchange Commission (SEC) designating Dash as a security. Early this year, the Core team constructed a very strong legal argument against Dash being a security, and as such actively pursued a no-action letter from the SEC. Having that legal argument at the ready has already had tremendous impact in approaching exchanges etc. who are wary of incurring extra regulatory burden. The SEC has given a series of questions in response, and these have been answered. Core is emboldened by the initial SEC response and is hopeful for prospects of receiving a no-action letter. Dealing with budgets effectively with market fluctuations is a priority for Core, which should help reporting. Core aims to never request more than 60% of the treasury except in exceptional cases, which will never exceed 80% asks. In drastic circumstances Core has some contingency plans, including several members voluntarily reducing their own salaries to legal minimums. Core ate through buffers significantly due to unanticipated level and severity of price drops. A new accountant hire will be starting soon, which is a very welcome development in running the finance department. Regarding Dash’s drop from the top ten market cap blockchain projects, Core admittedly did not do a good job of moving from design to implementation and migrating the roadmap, resulting in a “black hole” lack of information and direction. Investors may have lost confidence in the, lack of a clear and confident vision moving forward. The updated roadmap, especially after the 90-day assessment by Carroll, should help restore confidence, especially after the release of 13.0 and beyond. In a break from the trend, Dash transaction volumes haven’t been correlated with price, remaining relatively stable in the face of the market crash. Low-value transactions have also increased against high-value transactions, indicating real world usage as money. A big, exciting, complete ecosystem integration has been secured, however that can’t be detailed yet. Five more partners are in the pipeline as well. Business development is targeting four areas where Dash makes the most sense: cash, remittances, credit cards, and digital currency. The high-chargeback space is a prime target for Dash, including gambling and adult industries, as well as SEO consulting. In particular, online gambling and fantasy sports are perfect fits, especially those easily accessed by Dash’s GoCoin partnership. FanDuel is an important major partner in this area. In a plot twist for one of the less speculative and hyped coins out there, cryptocurrency trading is identified as a great use case for Dash. This is because InstantSend allows for the funding trading accounts instantly, as well as getting funds off of exchanges just as quickly. This not only makes the trading process much more efficient, it also makes it more secure, with users able to hold their own funds (even in cold storage) instead of leaving them on exchanges. Dash is targeting the 3rd and 4th-largest remittance markets, Philippines and Mexico (in particular Mexico), which showed to be most promising for Dash, rather than the first two which faced regulatory barriers. A recent paper by Arizona State University and Dash Core into block propagation techniques for mass scaling showed that Dash could easily scale up to 4mb blocks with compact blocks (implemented in 12.3), and could easily handle 10mb blocks using xthin, which is equal to over half of PayPal’s average transaction load. According to Dr. Darren Tapp, the research team is also experimenting with Graphene block propagation, which could enable seamless mass scaling far beyond 10mb blocks.